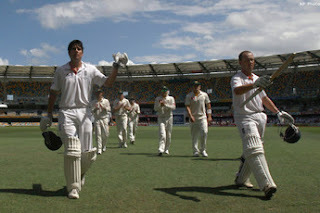 Till the 3rd day of 1st Ashes test match it looked like everything fell in place for Australia and they will win the Ashes opener and everyone was expecting the same from them because of 1st Innings lead of 221 run over England but hats-off to English team, they played like champions and confirmed themselves as favourite to win the Ashes this time. Captain Strauss lead from the front and put England in solid position with opening stand of 188 runs with Alastair Cook. Strauss made brilliant 110 runs and confirmed the fact that this time England will give tough competition to Australia and determined to win Ashes. After the fall of Strauss, Cook took the charge and he was supported well by Jonathan Trott. Trott scored century and Cook went on to get double century and finally on fifth day England declared the innings at 517 for just one wicket, rare statistics in test cricket. Although test ended in draw but it confirmed that Australia is no longer the force in world cricket and they lack good bowling attack and still they have not found the replacement for Warne and Mcgrath. Australian team expected a lot from Mitchell Johnson but he failed to deliver and remained wicket-less in entire test. Here on Ashes has become interesting and I feel they way England fought back in this match will give them lot of boost and confidence to win the Ashes Down-Under this time. For Australia, I feel they have to do lot of soul searching if they want to regain their supremacy. Overall Ashes Series have become interesting and with four matches to go, I feel England clearly have upper-hand but I also don't count Australia out of the series because lot cricket is still remaining in the series.